Open your heart for closed eyes. We just got our 2019 Calendar in! 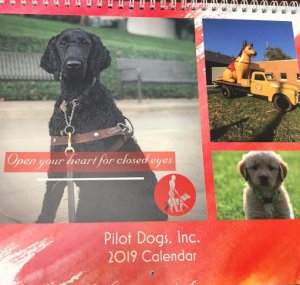 A 12-month calendar feating photos from Current Pilot Dogs, Retired Pilot Dogs, Pilot Puppies, and Pilot Dog Career Change Dogs. $10 a Calendar. Limited Supply! Online ordering no longer available. Supply is running very low. Call to see if any are left. © 2018 Pilot Dogs. All rights reserved.